I was super excited, because as we all know, a tomato fresh from the garden is to a supermarket tomato as bacon is to a piece of cardboard. They are full of flavor – the very essence of summer. But! 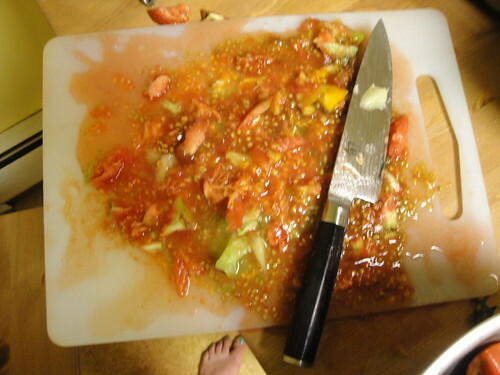 I was also worried, because it was a LOT of tomatoes, and they go bad so quickly, and Mr. Menace does not care for tomatoes in their un-sauced, un-ketchuped state. WHAT TO DO? 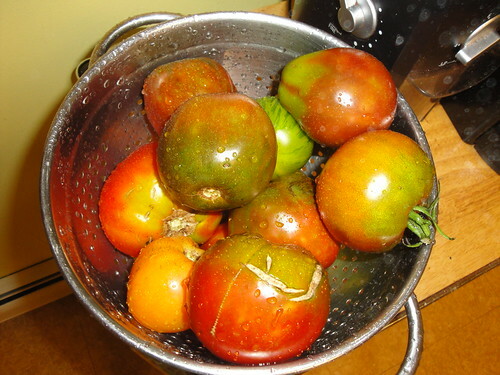 Then I remembered, vaguely, that Barbara Lynch’s Stir had a recipe that might do the trick – help me to extend the life of the tomatoes without completely removing the fresh sweetness of them. 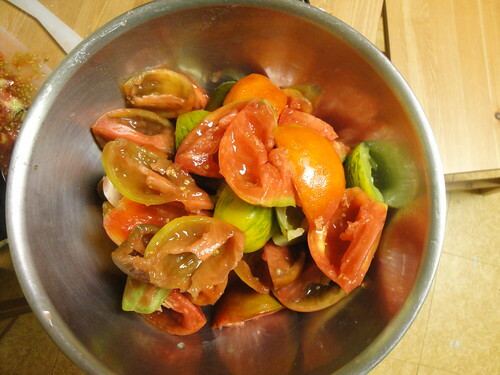 People – you can confit tomatoes. You can also confit fruit, with sugar. Essentially it comes down to preserving your food WITH the essence of the food, right? So how do you confit a tomato? The tomatoes are ready to go! 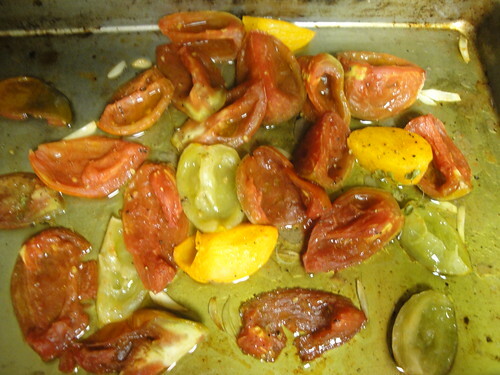 The result is soft, incredibly flavorful tomatoes and some pretty tasty olive oil, as well! The best part is that they’ll keep for 5 days, far longer than the tomatoes will on the counter. What can you then do with these products? I used the oil to cook up greens, flavor some quinoa, and over pasta. The tomatoes can be put in salads or a supremely tasty grilled cheese sandwich, but the confit recipe is actually part of a larger recipe in the book – tomato tarte tatin. I made those beauties too – so check out next week’s post to see how they came out!